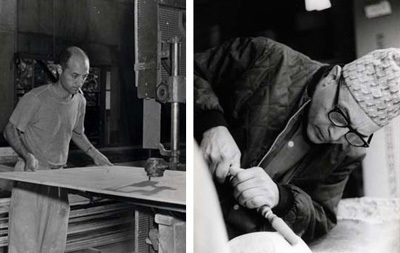 The Noguchi Museum's exhibition, Hammer Chisel Drill: Noguchi's Studio Practice is the first exhibit to explore the production process of Isamu Noguchi. Tools, films, photos, and sculptures work together to tell the story of methods of process Noguchi employed in his studios around the world. The exhibit is open through April 28. If you can't make it to the museum in Long Island City, The Noguchi Museum's website is well designed and includes a timeline showing Isamu Noguchi's sculptures, furniture, gardens, architecture, and ceramics, as well as his set designs that were collaborations with Martha Graham and other well known choreographers. Google images also offers a gallery of Noguchi's work to inspire. A wonderful look into a design mind! Isamu Naguchi's garden sculpture, table, and lighting.